10 day Vaikasi (May-June) festival, Tirukarthikai in November-December, Chithirai festival in April-May, Panniru Thirumurai, in October-November and Ammai Appar festival in September-October are the festivals celebrated in the Temple. The principal Linga is slightly slanting on a side with a scar caused by a hunter. 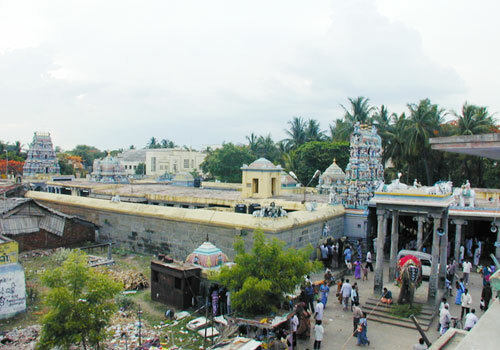 The stage or platform of the Linga called Avudayar is of two parts connected with Vishyu and Somasundara part joined together. This is a strange aspect of the temple not found in other places. 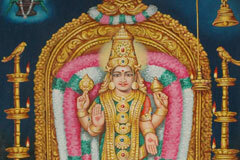 Saint Arunagiriar has sung the greatness of the temple in his Tirupuazh hymns. Devotees pray to Vikata Chakra Vinayaka in the temple with coconut, fruits, sugar and perform archanas for the welfare of children with Balarishta (Bala-children, Arishta-illness) aspects from the planets. 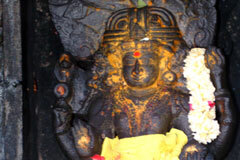 It may be noted that the invocation song in Kandapuranam by Kachiappa Sivachariar is addressed to Vikata Chakkara Vinayaka. Those worried about the adverse aspects of lizards falling on their bodies indicating omens, come to the temple for relief. Child boon, marriage, job opportunities are other prayers submitted to the Lord here. 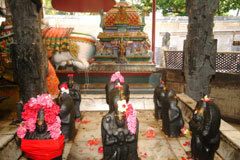 Sage Sukha worshipped in the temple taking a parrot form. 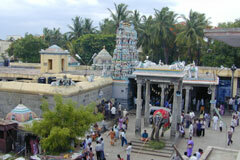 Hence, the place came to be known as Sukhavanam and the Lord Sukhavaneswarar. 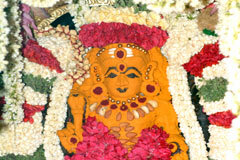 The temple is mentioned in the hymns of Arunagiriar and is linked with events as the Lord granting darshan to Aadiseha, Chera king, the Devas worshipping the Lord in the form of Bodhi tree (Arasamaram) and the celebrated Tamil woman poet Avvaiyar conducting the marriage of her adopted daughter. Devotees perform abishek to the Lord and Mother with Turmeric paste, Sandalwood paste and panchamirtham and also offer vastras. 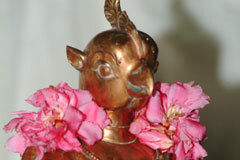 Planets Rahu and Mars are installed in different places against usual tradition. Praying to these planets would ensure a happy marriage and good jobs. 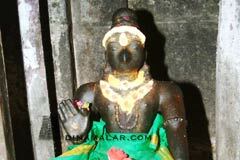 The symbols of Lizard and Udumbu-also a creature belonging to this family- above the Navagraha shrine relieves the affected ones, according to faith. Creator Brahmma was telling to some about the mystery of His creations being different from one another. 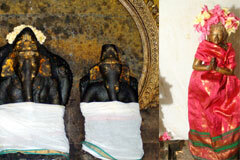 Sage Sukha, noted Shiva devotee, hearing the secret conversation, informed the same to Saraswathi, Goddess of Wisdom. Angry Brahmma cursed Sukha to become a parrot and said that he would be relieved of the curse if he prays to Lord Shiva in the Papanasam region (present temple area). Sage Sukha turning a parrot, came here with a huge number of parrots and began praying to Lord Shiva. A hunter came to the spot and wanted to drive away the parrots which hid themselves in an ant-hill. The hunter cut the ant-hill when parrot Sukha spread his wing to protect the Sivalinga in. Parrot Sukha ws also attacked causing profuse bleeding and death. Blood also oozed out from the Linga. Realizing the truth, the hunter killed himself. 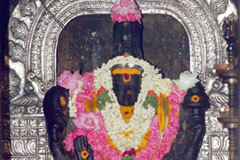 Sage Sukha getting his own form, prayed to the Lord to be here in the name of Sukhavaneswara which the Lord oblige. The temple came into being. Miracle Based: The principal Linga is slightly slanting on a side with a scar caused by a hunter. The stage or platform of the Linga called Avudayar is of two parts connected with Vishyu and Somasundara part joined together. This is a strange aspect of the temple not found in other places.